Hair loss is one of the most common problems that both men and women suffer from. As you are aware, human skin naturally secretes oil via the sebaceous gland known as ‘sebum’. 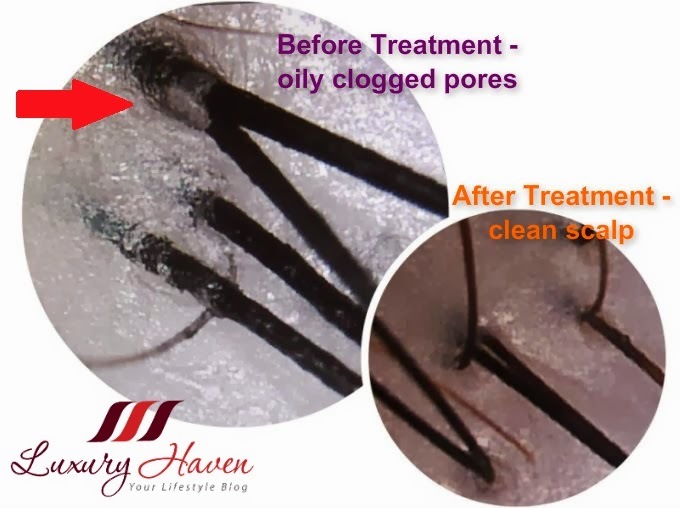 If sebum and other pollutants or dead skin cells start building up and form a hard layer of plaque, it will clog the pores and hair follicle will not be able to grow, resulting in problems such as hair loss. 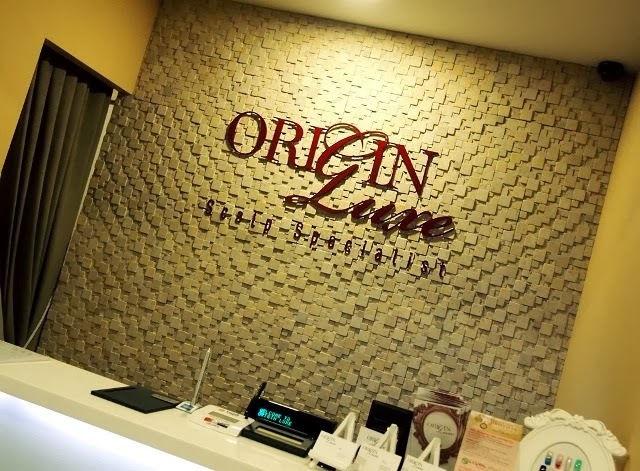 During my visit to Origin Luxe, located centrally at Chinatown Point, I learnt a lot from their consultant, Merlyn. She was extremely thorough in her explanation during my consultant. After filling up a questionnaire, she did a scalp analysis before recommending me the right treatment. One of the interesting topics I learnt is that clogged pores will not be solved by simply washing your hair with a good shampoo, even if you wash it vigorously. From the computer screen shot of my analysis, I was shown my clogged pores which needed to be rectified. I shared my concern on my grey hairs. I’m seeing more signs of greying as I’m climbing towards the 50s Club. I don’t have a lot, just few strands here and there, but being a woman, it’s naturally quite a big thing. Lol! 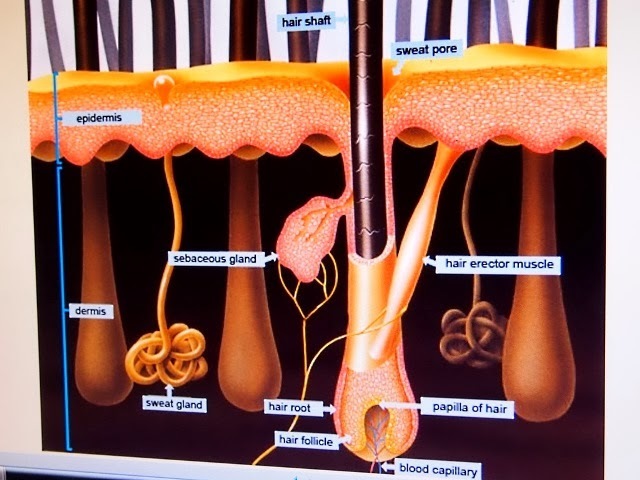 My therapist also explained that a healthy hair follicle should have 3 strands of hair in 1 follicle as shown above. Do you know this too? After the analysis, Merlyn said she would give me a treatment to tackle the clogged pores as well as to cover those grey hairs. I was really eager to try out this 2-in-1 treatment. I was then led to their spacious salon, which has a clean elegant look. 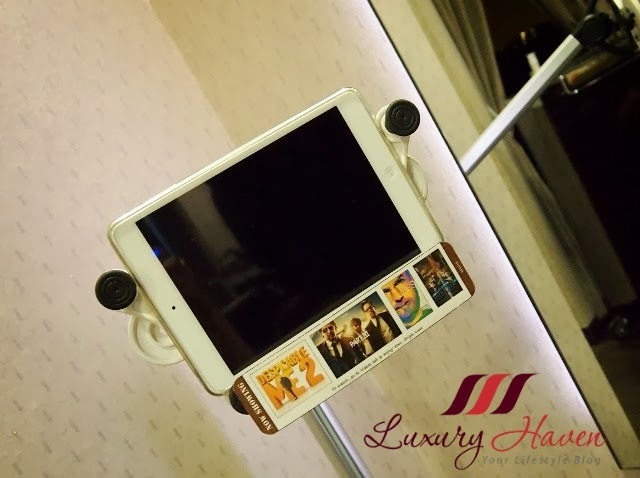 There’s even an iPad on every seat to help customers pass their time! How thoughtful! 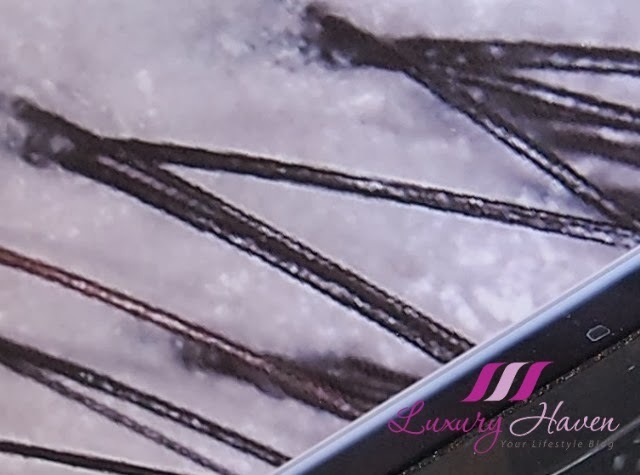 Step 1: The High-frequency therapy provides a very gentle, safe and relaxing effect on the scalp; helps to detoxify scalp and kills germs at the same time. It also helps the cells to regenerate. Step 2: Giving the scalp a massage using a wooden comb. Improves blood circulation, and loosen dead skin cells. Step 3: I was ushered to a hair wash. After a gentle rinse, a Ginger Tonic was applied to my scalp to open up the pores and stimulate the hair follicles. Step 4: An Essential Oil which smells like Lemongrass was next applied to the hair ends to help soften the hair. Step 5: Customized Herbal Mask using Origin Luxe’s formulated recipe, made from a premium mix of Chinese and Ayurvedic herbs. The special concoction is slowly and carefully brewed for 2 hours to allow thorough extraction of essence and nutrients. The treatment masks are then immediately packed into individual sachets to ensure freshness and avoid contamination. Upon customer’s arrival, the herbal mask is heated up to further prevent contamination. It also facilitates the penetration of the herbal essence into the scalp and helps stimulate healthier hair roots. The herb that was applied on my hair gives colour to my grey hair, as well as slows down the growth of grey hair. Step 6: My hair was next put to a micro steaming with the mask, to open up pores for the herbs to penetrate. Step 7: Deep cleansing hair wash after the 30-min mask treatment. Step 8: A heated pad was put on my shoulder after returning to my seat. It was a great pleasure cause I was feeling a bit cold after the hair wash. Thumbs-up to this idea of giving customers the extra comfort! Another tonic was applied after drying my hair to give vitamins and nutrients; it has a minty effect on my scalp. My therapist went on to massage my scalp to improve blood circulation. Step 9: Blow dry. I like how Merlyn had twisted my hair while blowing, giving me some nice curls. I didn’t expect much from the styling part. After all, they aren’t exactly full-pledged hair stylist. But the job was pretty neat, I would say. Step 10: Infra-red Therapy helps penetrate tonic and simulate hair growth. Finale: Another analysis was made to check the scalp. I was happy to see my clogged pores cleared. The brownish strands of hair that you’re seeing in the pix are actually couple of my grey hairs. Besides treating my scalp, it helped cover my grey hairs too! Isn’t that great! Merlyn explained that this treatment is very popular with her clients as it provides them with an alternative, instead of going to hair salons to colour their hair which can be very damaging. I totally agree that this treatment is certainly a healthier way of covering grey hairs, don’t you think so too? The only effect is that your original shade of colour will turn lighter after the treatment, but that doesn’t bother me at all. Thank you, Origin Luxe and Merlyn, for taking good care of my hair and scalp! Verdict: Professional analysis, with skillful treatment at Origin Luxe. Most importantly, no hard-selling at all! I’m pretty impressed that with just 1 treatment, my oil clots were all removed. But of course, it's best to have a maintenance program to clean your scalp on a regular basis. I was told that it’s best to seek early treatment, else existing hair will drop and no new hair will grow because the pores will close due to oil clots. Scary, isn’t it? 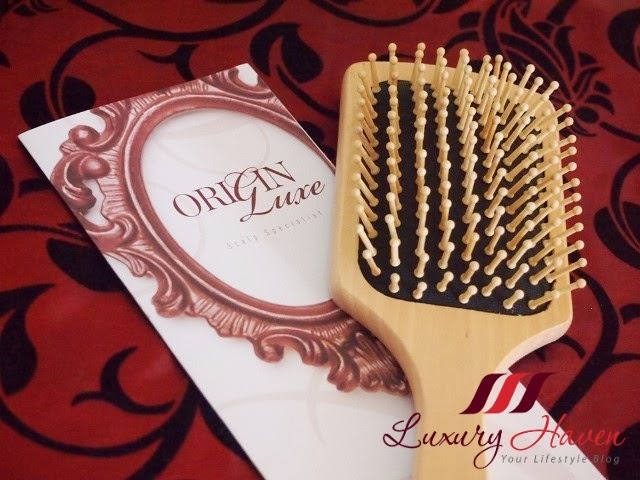 I got a new wooden comb from Origin Luxe, the same one that was used to massage my scalp! Our hair is like grass, they need good soil to grow, so I must spend more time pampering my hair from now. 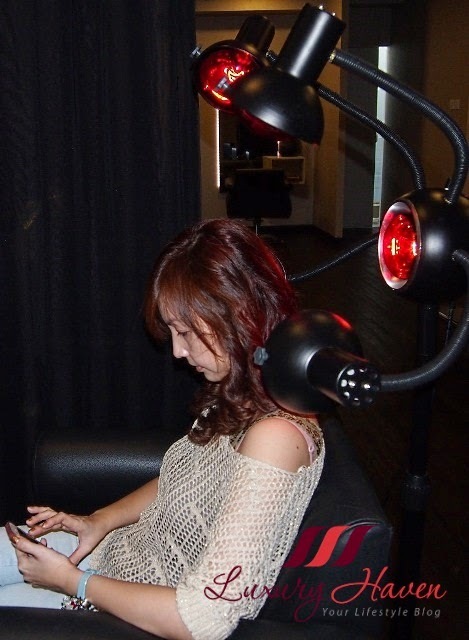 Quote “Luxury Haven” to get the above Customized Scalp Treatment for just SGD 18, usual SGD 150! High frequency in Step 1. Infra-Red Therapy in Step 10. Promotion is valid till 7 Jan 2014, and only for first time customers of Origin Luxe. Please call +65 6702 0777 for your appointment! Do not use our nails to scratch our scalps, but our finger tips instead! Apply conditioner only on hair ends, and not the scalp. Amazing information how to make your hair look great and help the loss. Jackie, thanks for the lovely note & love having you here! Reana, hahaha! You really make me laugh, my dear! I've done my fair share of hair treatment some where else whereby the steps are about the same except the last step whereby the infra ray helps to stimulate hair growth. But the price that I paid is much much more as compare to Origin Luxe. I shall bare this in mind, should I need a treatment, I shall consider Origin Luxe. DS, you can always go for the trial & see if the result is better over at Origin Luxe. After all, it's just $18 for 1st trial! wow that seems like an amazing treatment, wish they open up in India soon. I just can't belive that you are climbing towards 50s club, you look very young. But you look like as if u are in your 30s, so numbers don't matter. Do share your youth secret with me. Subha, age can be so deceiving, isn't it? Numbers don't matter to me, so long as we're young at heart! Fascinating, Shirley!!! Your hair is so silky pretty. That sure was "royal" treatment you received. I'm not one to spend 2 hours on hair treatment but maybe I should consider it since I have more than a few strands of gray, lol...Thanks for sharing, Shirley. Enjoy your "new" healthy hair!!! I am also in the same age bracket Shirley and the few white strands are also getting to me. I don't know why but the grey strands must appear right on top. The treatment is fabulous and I can see the outcome. Wow, your hair looks glossy and shiny. Nava, that's probably one of the reasons why we could click so well. ^_^ Those grey hairs are irritating, aren't they? Lol! Kathy, are you too stressed? You can't be older than me. Lol! Thanks for the info! Haha. One grey hair to me is a BIG issue. Lol. I used to have thick hair. After having 3 kids, I lose the lustre hair. Rose, that's so true! Hahaha! We ladies are super vain. Lol! Yes we all lose hair for different reasons. I always had very good hair however in last few years I started loosing and when I had scalp analysis through a doctor he said I still have so much hair and should not worry about it. I know my hair is getting thin and falling so I take care by massaging with oil, using light shampoo and air dry. I like your post about getting some professional help and there is no harm in trying infra red therapy for better hair growth. Bal, I've to admit I haven't been paying much attention to my scalp & losing hair is the last thing I wanna have. Thanks for sharing your tip, & have a good weekend! I'm impressed... seeing the difference before and after this treatment. Happy to tell my friends this place if they need to check out their hair loss problem. Zoe, thanks for sharing & hope your SG friends will benefit from it too! 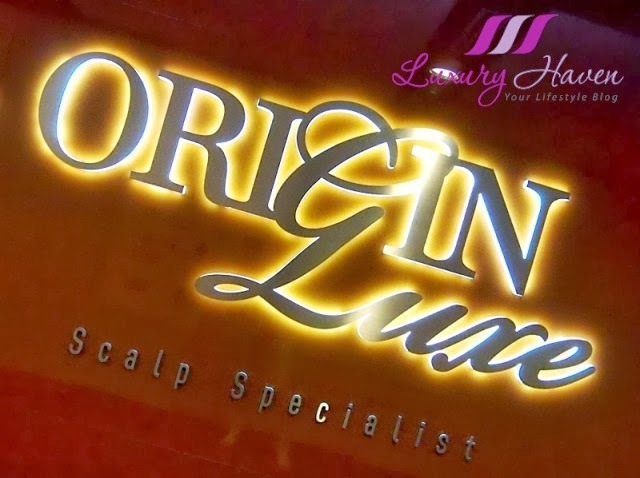 Seems like Origin Luxe indeed a great place for hair care!! I don't have any hair problem but for a regular check up I'm looking forward to consult one of the experts of that hair salon. Thanks for letting know some important aspects about that place. Lena, glad you've found the post informative! Happy weekend! Pepper, thanks sweetie! Have a good weekend! before and after really big diff.. totally clear up the oily cleared pores.. good one!